A Classic...and for Good Reason! Johnson's Baby Shampoo has been around forever. This was the first shampoo I can ever remember. My mom used this on my sister and me to effectively, gently wash our hair. Johnson's slogan, "No more tears" is so true because this can run right into your eyes without irritation. I love that Johnson's has not changed this as the years have passed. They know they have a winner. 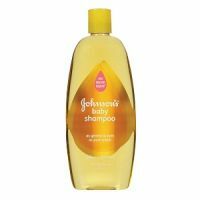 Now that I am in ...read moremy late twenties, I have revisited this classic shampoo. I now use this to wash my makeup brushes. It works better than anything else I have used! It is more effective than specialty brush cleaners and other shampoos I have used on my brushes. This is also so cheap! I big bottle was less than $5 and will last me quite some time. I squirt a small amount into my hand and swirl my wet (dirty) makeup brush in it and it rinses clean. I don't have to go in for a second cleaning like I would have to with other shampoos. The smell is light, fresh and reminiscent of my childhood. There is a reason this has stood the test of time...it's great! I used this all the time on my first child and it was great, It would leave him clean and smelling so nice. Then I had my second son, and I used this on him as well. At around 9-10 months, He was getting real dry and itchy skin and he would scratch it so much that he would cut himself! I would constantly apply lotion but I decided to ask his doctor about it. Right away she asked me what shamp...read moreoo I used for him and I told her Johnson and Johnson. And what she said surprised me. She said that this shampoo can actually be drying for baby's skin. Maybe this is not true for all babies, as I didn't have this problem with my first son but my youngest does have sensitive skin. So I immediately bought a different baby shampoo, and with in a week his dry skin was gone and he stopped scratching! So I mean it is a really good shampoo, but I guess not for some babies with sensitive skin. So unfortunately I had to stop buying this.